If you see artwork on this website that you wish to purchase, you may phone me directly at 780-459-3747. I can take your credit information over the phone and simultaneously enter the number into our merchant sales terminal. You can trust that your credit information will not be stored. Once the payment has been processed, I can then scan and email, or mail you the receipt. Your painting will be shipped or delivered to you as quickly as possible. I also accept cheques which must clear before the painting is shipped or delivered. Shipping charges may apply. See below the photo for pricing information. 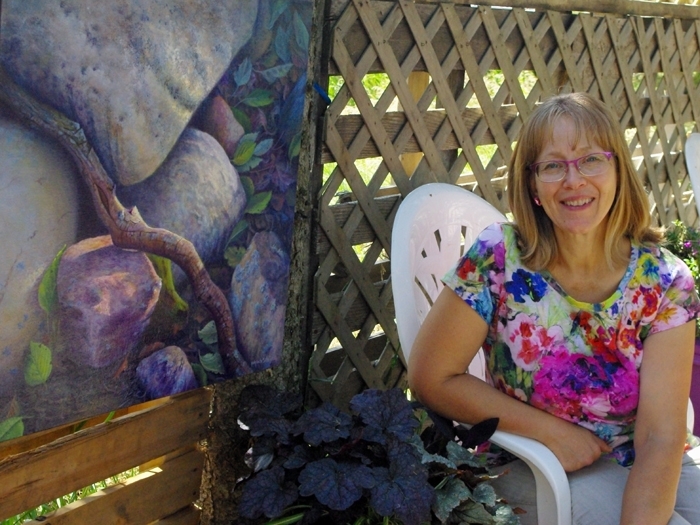 Happy in the garden beside a painting inspired by one of the areas in my front yard. The prices for my paintings are charged at the same rate whether you purchase the work at my Studio, at a Gallery, over the phone, or at an Art Club Show. My prices are calculated through a formula based on size. All paintings for sale are original works on quality canvas using excellent quality artist materials. See below photo for custom paintings (commissions) information. Things move fairly quickly in the beginning of a painting. Creating a piece of artwork that has personal meaning to you or your family would be my pleasure! 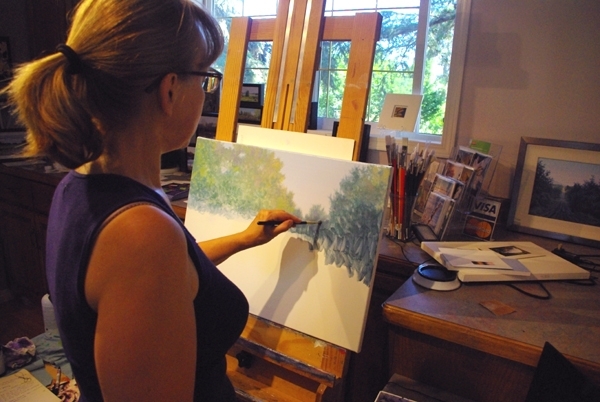 If you would like to have a painting of a scene from your farm, garden, a special vacation spot, or a grouping of objects that have special meaning for you, please call me at 780-459-3747 so that we can discuss your ideas. You may also email me bristelybrush@hotmail.com. I cannot accept people or pet portrait commissions at this time. I value your privacy as much as I do my own and promise to never share, sell or otherwise pass on any of your contact information to anyone else. The contact information that you share with me will only be used to send you invitations to my shows, send you my newsletter and the occasional small gift. I promise not to overload or spam your mailbox. If you wish to be removed from my list at any time, contact me by phone, email or by clicking ‘unsubscribe’ in the newsletter. If I send you anything by regular post mail and have it returned to me, I will assume that you no longer wish to receive mail from me. See below the photo for my return policy. 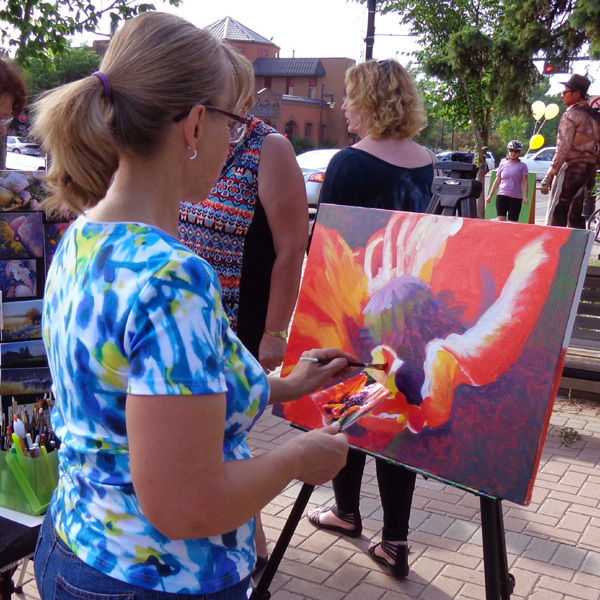 Painting on the street in St. Albert Alberta. You may return a painting you purchased directly from me for up to 6 months after your purchase date, for a 100% refund. The painting and frame must be in good, re-sale condition. After the 6 month period, if the painting and frame are in good, re-sale condition, you will be refunded 75% of your original purchase price. If the piece is not in good sale-able condition, we can negotiate the refund amount according to the extent of the damages. If you purchased the painting through a gallery or venue other than directly from me, your refund amount will be your purchase price minus the commission I paid to the gallery or other venue and the 6 month policy also applies. I reserve the right to limit the number of returns from you at 1 item per year. Return shipping charges, if applicable, are the responsibility of the purchaser. I also reserve the right decline returns on commissioned paintings.